Though mac and cheese is typically synonymous with southern comfort food, New Jersey knows a thing or two about it. This savory side dish is a certain crowd pleaser, dishing out warm, cheesy goodness in every bite. You don’t have to travel south to get some of the best you’ve ever tasted, either: just head to these 10 best places for mac and cheese in New Jersey and eat ‘til your heart’s content. Known for all things cheesy and melty, this place knows their way around some mac and cheese. Their cheesy mac and rib combines their delicious pulled pork with mac and cheese, or you can add mac and cheese to any grilled cheese sandwich for a match made in heaven. It’s an adventure in comfort food you won’t forget. Here you can get your fill of mac and cheese in more ways than one. Add it to a grilled cheese sandwich, get it hot and smoky, enjoy it with some buffalo chicken, get ‘em fried and bite-sized, or dive into their famous BBQ Mac and Cheese Steak. Truth be told, there’s no such thing as a bad choice here. Yes, they’re known far and wide for their all-natural burgers, but their mac and cheese shouldn’t be overlooked. Their mac and cheese egg rolls should be world famous. Or, you can add just the mac and cheese to any burger or hot dog for a unique twist on a classic. This place is so much more than just a pizza restaurant. 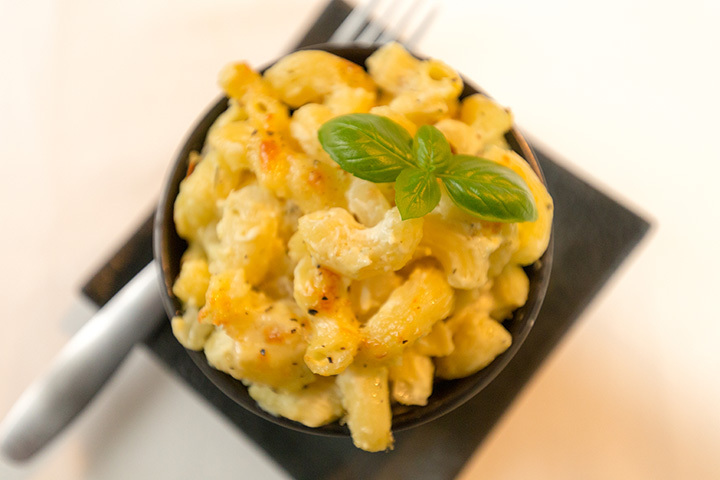 Alongside various Italian favorites, you’ll also find a huge menu of mac and cheese combinations that make it hard to choose just one. Classic, white truffle, cheeseburger, Mexican, spinach and artichoke, buffalo, and tuna casserole mac and cheese are just a slight few of the options, and you’ll want to try them all to find the true winner in a sea of champions! This laid-back hangout is the place to be for lots of good things, but namely their mac and cheese. You can add side of baked mac and cheese to any entree and it immediately makes your meal 100% more satisfying. Pairing it with other southern staples, like their fried chicken or catfish, and you have an instant winner for dinner. Is there anything than a steaming bowl of macaroni and cheese? Didn’t think so! This cozy cafe has some of the best in the state, especially when you compare portions and prices to quality and taste. Known for their amazing grilled cheese sandwiches, it’s no surprise this place also has equally amazing mac and cheese. You can add mac and cheese to any grilled cheese sandwich for the ultimate in cheesy goodness. Or, be daring and order the mac and cheese burger. They also have a full section dedicated to building your own mac and cheese dish, complete with things like crab cakes, jalapenos, chicken tenders, mushrooms, fried pickles, and more. Known for their award-winning burgers and long-running happy hour, you won’t find better mac and cheese anywhere on the Jersey shore. Their appetizer offers a hearty portion that’s perfect for sharing, though it’s so good you might want to keep it all for yourself. The lobster mac and cheese here combines two of Jersey folks’ favorite foods into one tasty dish. They use their signature house cheese sauce and high-quality lobster for a scrumptious rendition of this classic meal. If you’re looking for another cheesy twist, they also have a killer truffle mac and cheese that is like heaven on a fork. Dinner with a view is only made better by their fried mac and cheese bites. Breaded and fried until golden perfection, these make the perfect starter to every meal.